Like the Marlborough, the Mass was built in France but sold largely on the British market, and its name came from the British importer Mr Masser-Horniman. The first cars were assembled voiturettes typical of their period, with 4 1/2hp Aster or 6hp De Dion Bouton engines and tubular frames, many components coming from Lacoste et Battmann. A 10hp 2-cylinder De Dion with twin carburettors was offered in 1904. Ownership of the company is somewhat uncertain; Masser-Horniman was described as the proprietor in 1904, with premises in Ladbroke Road, North London and the 'principal' in France was Leon Pierron. From 1912 his name was used for the cars sold on the French market. The manager of the Courbevoie factory in 1907 was Englishman J.R. Richardson whose Lincolnshire-based company also sold Masses and made Richardson cars. It is possible that the Richardson was in fact, a Mass; certainly the smallest Richardson of 1905 had a 6 1/2hp single cylinder, as did the smallest Mass. 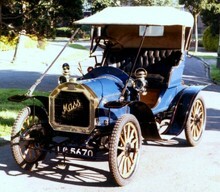 In 1911 the biggest Mass had a 4.9 litre 4-cylinder engine and for 1913 came the first six. By then it was becoming difficult to sell cars in England, and Mass Cars Ltd took on agencies for American R.C.H. and Paige cars, selling the latter under the name of Mass-Paige.